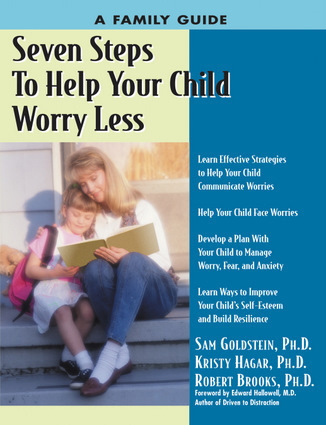 This guide for parents offers practical strategies to help teach children relaxation techniques, correct ways of thinking to combat worry and anxiety, and empowering behavioral interventions. Parents are encouraged to understand why children worry and to recognize if a child needs help with excessive worry. Explained are how to create a plan to help a child, effective strategies to reduce worry, and how to build a child's self-esteem and confidence so he or she can become more resilient. Additional guidance for medical professionals and for teachers is provided. Sam Goldstein, PhD, is a clinical neuropsychologist and faculty member at the University of Utah. He is the author of Raising Resilient Children. He lives in Salt Lake City, Utah. Kristy Hagar, PhD, is a pediatric neuropsychologist at Children's Medical Center and an assistant professor in psychiatry at the University of Texas Southwestern Medical Center. She lives in Dallas, Texas. Robert Brooks, PhD, is on the faculty of the Harvard Medical School and is the coauthor of Raising Resilient Children. He lives in Boston, Massachusetts.